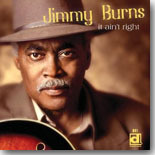 Chicago artist Jimmy Burns is one of the best in combining the sound of his native Mississippi blues with uptown soul, as heard on Delmark's It Ain't Right. It's this month's Pick Hit. Our Surprise pick this month highlights the new Delta Groove CD, Fifty Shades of Blue, from Anthony Geraci and the Boston Blues All-Stars. Our Flashback feature reviews a book covering legendary bluesman Son House's life from the mid'70s through his death in 1988. Our What's New section features reviews of new CDs from Debbie Davies, Shemekia Copeland, D.L. Duncan, Ragpicker String Band, Mick Kolassa, Corte', Bob Malone, Jay Gordon, Buddy Guy, Albert Cummings, and more.